Located within the city of Chennai. By road, train, air and sea. Also known as Brundaranya Kshethram. Venkatakrishnan is present with Balarama, Aniruddha, Sathyaki and Pradyumna. Varaha Perumal and Narasimhar are present inside Ranganathar sannidhi. Sri Rama is present with Sita, Lakshmana, Bharatha, Shatrughna and Hanuman. Varadar is the thirukkolam of rescuing Gajendrazhvan. Thelliya Singar is in the Yoga Narasimhar thirukkolam. 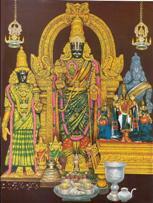 Srinivasar promised to show his thirukkolam of being a charioteer, to Sumathi Rajan and is present as Venkatakrishnan, with Panchajany in His right hand. The mark of the arrows that Bheeshma shot and were received by Krishna, can be seen on the divine face of Parthasarathy. Thirumzisai Azhvar, Ramanujar and Manavala Mamunigal mangalashasanam.